Are you in need of new kids bedding sets? 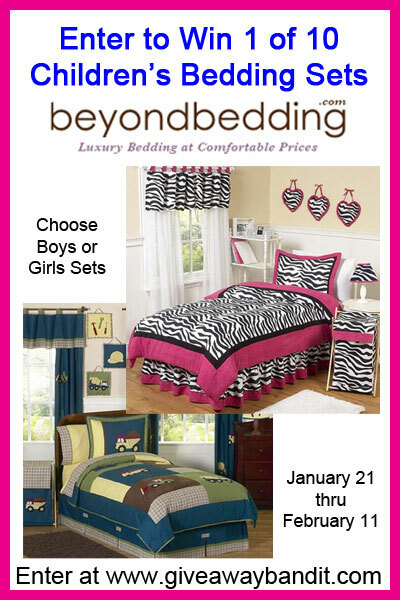 We have teamed up with Beyond Bedding to give away 10 children’s bedding sets! We absolutely love Sweet JoJo designs after our construction zone kids bedding review.
. It is so cute! Giveaway is open to US and Canada residents, ages 18 and older. Enter to win via the entry form below. Giveaway ends February 11, 2013 at 11:59 pm EST. Good luck! Follow at Brittany1987 says account has been suspended! Other than that all foloowed 🙂 Thanks! The Sea Turtle Kids Bedding! I’d love the dinosaur toddler bedding. So cute! Ethan Green and Brown Modern Teen Duvet Cover Bedding my son will be 13 in april and really needs a room update for an older kid. I like the Monkey Kids Bedding. Brittany 1987 account has been suspended, unable to follow on twitter. I would like the Dinosaur Toddler Bedding for my grandson. He LOVES dinosaurs! I would pick the Hot Pink, Black and White Isabella Girls Baby Bedding 9 pc Crib Set! Visit BeyondBedding and let you know which bedding set i would pick if i won. 4pc Twin Set by Sweet Jojo Designs.